Want to give your kids a clever geographic learning experience and encourage imaginative playtime Opt for a large world map, which is an excellent choice for any boy or girl, and work this into your decor. Worldly urban surroundings.This world map really transforms this space into something special! This wall art decor depicts a map of the world in a vintage style.Perfect for your home or office, the large wall art collection is printed on canvas. 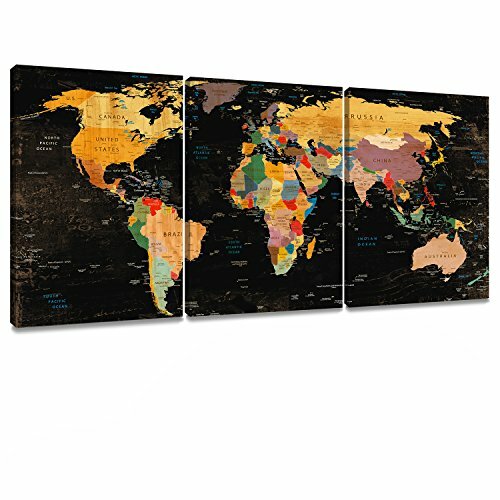 This world map print will fill any space with the spirit of adventure and curiosity. Decor Mi is one of the largest online suppliers for modern canvas wall art, including oil paintings on canvas, Watercolor paintings, Drawings, Painting photograph, Photo to portrait painting, Photo to canvas print, Canvas prints. Our wall decor category provides high quality yet affordable canvas art. All the paintings/prints are created using the professional giclee prints HD printers on hight quality polyester canvas .Nothing like the prints you could find in the market! You can have a copy in your own home or office which can be exactly like the original painting in the museum or sotheby's. ★ Modern Colorful STYLE - This wall art decoration depicts a map of the world in a colorful style. Unique World Map. Worldly urban surroundings. Fill any space with the spirit of adventure and curiosity. An excellent choice for any children learning experience. ★ HIGH QUANLITY - Size: 12" x 16" x 3.High resolution printing on premium artistic canvas, by using a high quality mirrored gallery wrapping technique which extends the picture all the way around the wooden frame. ★ ORIGINAL DESIGN - 100% by the professional designer. Perfect wall art decoration for any Home or Office. ★ 30 DAY BACK MONEY GUARANTEE - If you are not satisfied and wanna return the canvas for whatever reason in 30 days after receipt, we accept it and return your payment. If you have any questions about this product by Decor MI, contact us by completing and submitting the form below. If you are looking for a specif part number, please include it with your message.